During this school year, my daughter faced her first teachers’ strike. They were rotating strikes, so not all teachers walked off the job at the same time. Since my daughter is only in Senior Kindergarten, she will likely face a few more possible teachers’ strikes before she graduates and moves on in the world. For me, as a working parent, initially I only saw this situation from a purely selfish point of view: When the teachers go on strike, what will I do with my daughter? But I wasn’t only considering it from the point of view of childcare. My daughter likes school. She has been trying to come to terms with the fact that we moved her from an all-day kindergarten program to a half-day program. (We put her in French Immersion last September and the French Immersion school hadn’t been approved for full-day kindergarten at the time.) She can’t understand why we would take her out of full-day school. She constantly admits to be being bored at home with only Mommy for entertainment. So, facing the teachers’ strike, my daughter was devastated that she couldn’t go to school at all. I hope that her love of school and of learning continues throughout her years in the education system. And I hope that she doesn’t struggle in school like I did. But I worry. What parent doesn’t? What if she resists learning at some point? What if she doesn’t resist learning, but she faces other difficulties at school like being overcome by shyness or other social skill issues? I know I may be worrying needlessly, but I faced issues like those in school and I’m afraid for her. 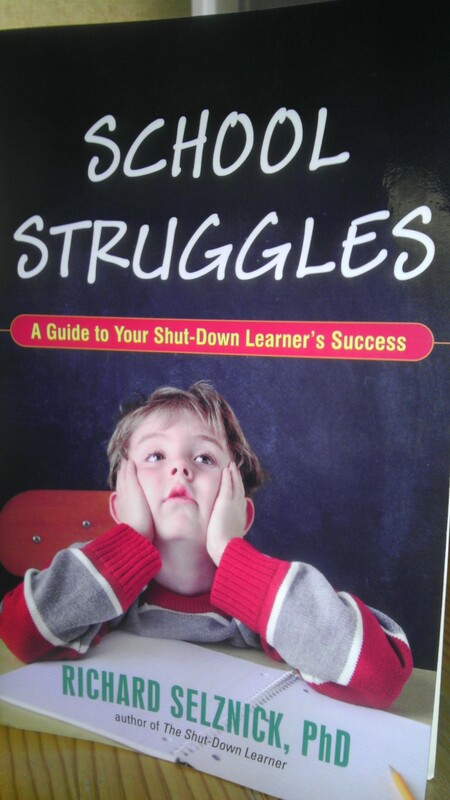 A book I recently read called School Struggles — A Guide to Your Shut-Down Learner’s Success has helped alleviate some of my concerns. Written by Richard Selznick, Ph.D., NCSP, the book covers struggles in reading, ADHD, social skills, and parenting. It’s geared toward teenagers who have become shut-down learners over the course of their education, but the author addresses issues for parents with younger children and how to help them avoid becoming a shut-down learner. I found his points very helpful and easy to understand. And I particularly like how he addresses the guilt that moms shoulder for their children’s behaviour. It was relieving to see it written in a book that how my daughter reacts to some things (like the anger she has levied on me all year for putting her in a 1/2 day program) is probably not my fault. It’s more likely to do with her personality make-up and, though I didn’t cause these personality traits in her, I have learned from reading this book how to better manage them. It’s definitely an interesting read if you suspect that you’re faced with a shut-down learner and want to know how you can help your child. Disclosure: I received a complimentary copy of School Struggles — A Guide to Your Shut-Down Learner’s Success for this review. I was not compensated in any other way. The opinions expressed above are my own. This entry was posted in Uncategorized and tagged Betterment, education, kids, Kids, learning, Motherhood, parenting, Parenting, Reviews & plugs, school, shyness, social skills, Ultimate Blog Challenge on April 18, 2013 by Nancy. Geared towards these kind of learners – but they would never read it. Anyway, this is true of a number of my students.